✅【Easy Installation】The installation frame enables perfect alignment of the protector. The cleaning cloth and dust remover give you a bubble and dust free application.✔ Upgraded Ultra-slim：Thanks to advanced craft, the new generation screen protector for iPad 9.7 becomes thinner than ever before, More responsive sensibility raised by 80%. 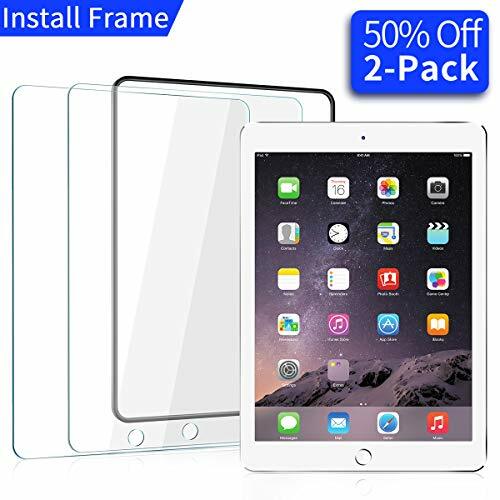 ✅ 【6X Stronger】6 times of tempered time, this glass screen protector for iPad 9.7 can withstand 23lbs. of force and protects your screen from damage. ✅ 【Anti-Fingerprint】This screen protector for iPad 9.7 with anti-fingerprint coating. Newest tempered glass, its surface adopts nanometer thin oil coating which is anti-fingerprint, oil rub resistance. ★★Lifetime Warranty★★：Ainope provides you with professional customer service and the screen protector for iPad 9.7 is supported by Ainope's Lifetime Warranty.